City Hall sits on the site of the first building in present day Stockton. In 1844, the first settlers arrived at Rancho del Campo de los Franceses. 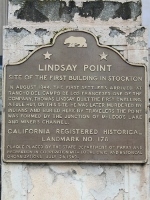 One of the company, Thomas Lindsay, built the first dwelling, a tule hut. He was later murdered by Indians and buried here by travelers. The point was formed by the junction of McLeod's Lake and Miners Channel.